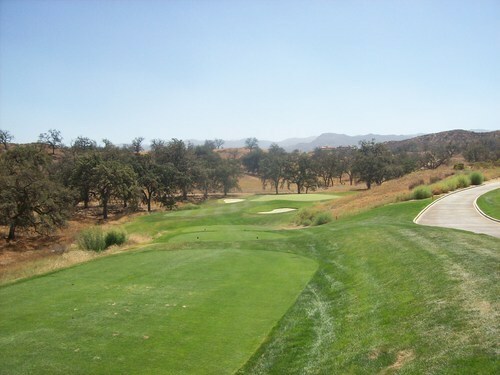 This is an executive course I’ve always heard pretty good things about, so I was happy to finally play it. They actually have two courses here. 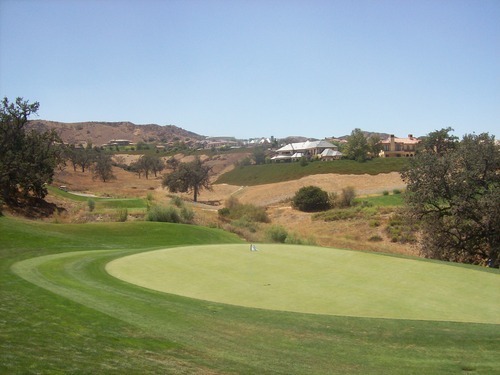 Vista is the 18-hole executive layout (par-61) and Chica is the 9-hole par-3 course. They also now have a “foot golf” course set up over by Chica, if you are into that sort of thing. 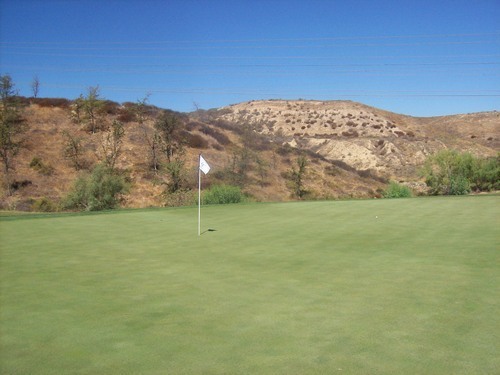 I was there to play the Vista course. 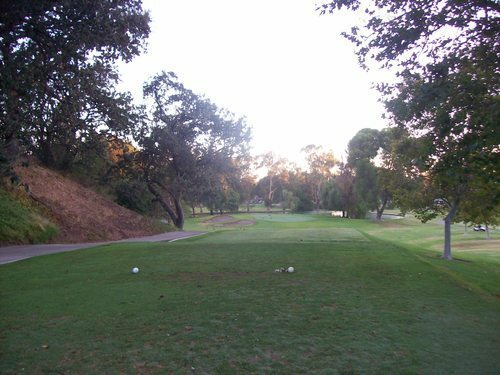 I got up there while it was still dark and was teeing off by myself around 6:00 as there was just barely enough light to get started. Apparently, there’s a regular who comes out here almost every day and starts well before dawn. I actually caught up to him on the back nine, but the total pace was excellent at a little over two hours walking. The price was $22.50 to walk. 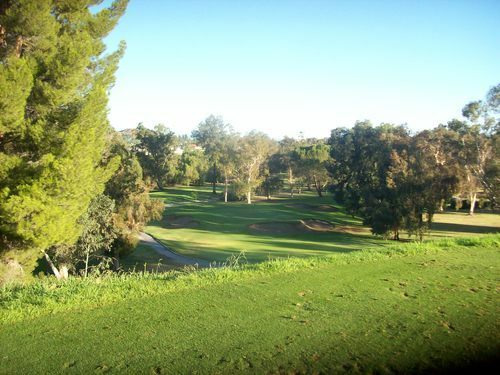 Vista Valencia is a pretty enjoyable little course in a nice setting, though like its big brother, Valencia Country Club, features several holes running right along the busy I-5 freeway. 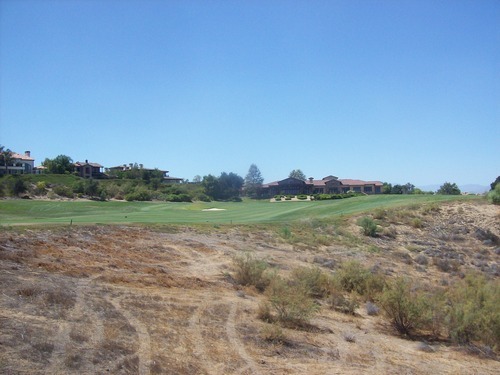 Locals will refer to the country club as “Big V” and Vista Valencia as “Little V.” Otherwise, there are some pretty holes back in a little canyon with nice homes atop the hills. 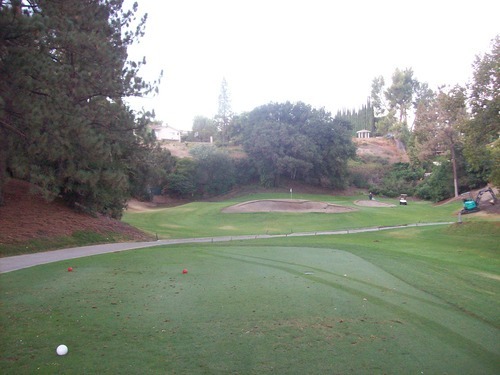 The highlight stretch is 11-14 with back-to-back-to-back-to-back par-3s up and down the hills. 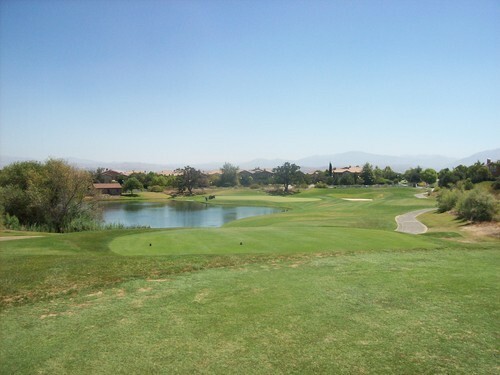 The signature hole is the par-3 17th with an elevated tee and an island green complex. I liked this hole a lot. 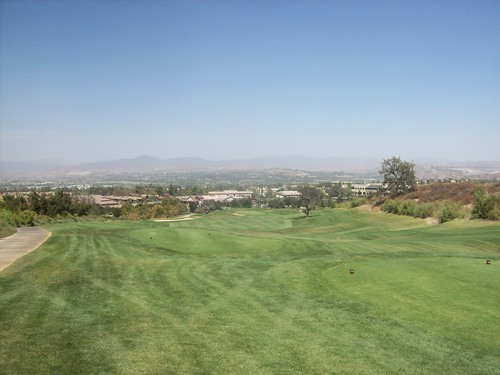 When you see the par-61 on the scorecard and only 4,376 yards total, you might think this course will be a pushover. It’s not. There are a few really short par-3s under 100 yards, but then there’s the 2nd hole which plays 222 yards from the blue tees. There are no par-5s and the par-4s are a pretty decent mix of lengths. 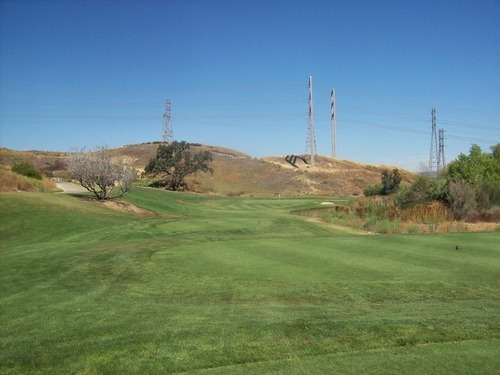 The longest one (the 10th) tops out at 452 yards while the shortest is 320. 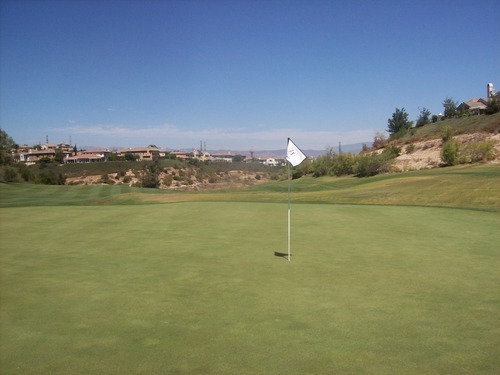 Vista Valencia offers just enough challenge and diversity to keep you entertained, along with a solid value for a shorter course that’s fairly well maintained. The course had its bad spots and there was way too much goose poop out there, but it was mostly relatively lush and green. It was very soggy and soft that early in the morning, but I’m used to that as an avid dawn patroller. They have been reworking many of the bunkers here. A friend of mine who plays here a lot said they cut down some of the big lips on several of the greenside traps. There are a few that still need new sod around the edges and it seems they are in the middle of the process of replenishing the sand. I found a few traps with mixed results. For those who live near here, this is a good option for an easy, inexpensive round. It’s not worth going out of your way for, but it’s a solid little executive course and what I saw of Chica also looked decent for a short par-3 layout. 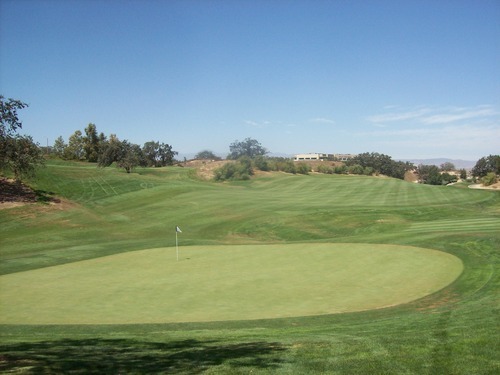 Note: This course has since dropped the TPC affiliation and changed its name to The Oaks Club at Valencia. 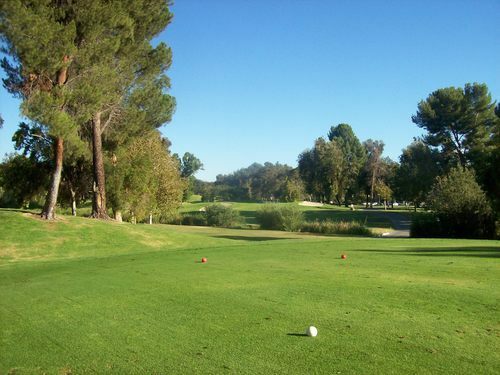 Valencia has its own little golf triangle sandwiching the freeway. 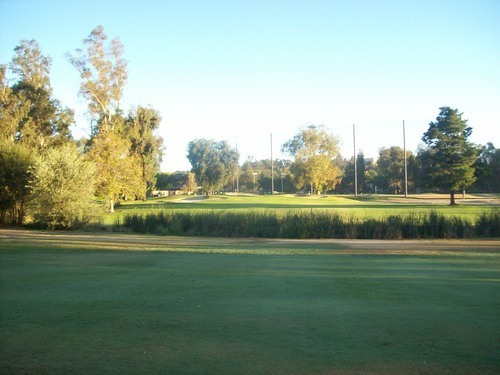 To the east you have the older courses, Valencia Country Club and Vista Valencia. 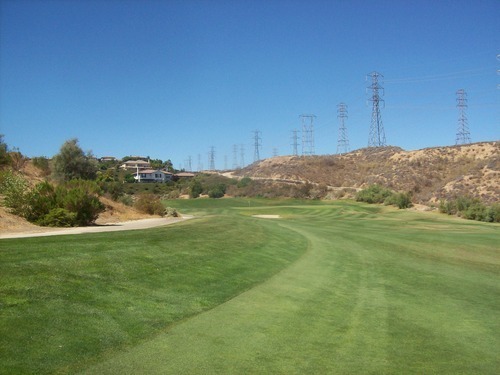 To the west (just south of good old Magic Mountain), you have the newer course, TPC Valencia. Though normally private, they do have a number of outings here throughout the year, so it’s one that’s not too difficult to get on if you can time it right. A friend let me know they were having this member for a day event and the price was only $60, so I signed up in a heartbeat. That’s a great price for a course of this caliber. 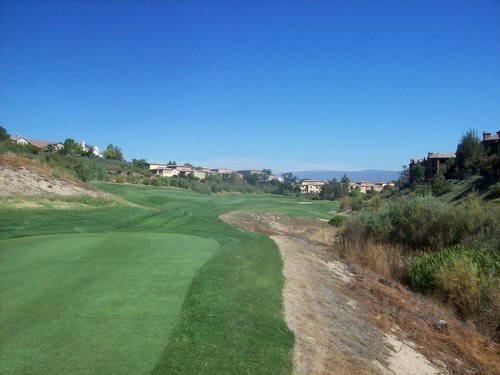 TPC Valencia was designed by PGA Tour Designs with consultation from veteran tour pro, Mark O’Meara. Even though it has the PGA connections, I couldn’t ever imagine a major professional tournament here. It doesn’t seem like one that modern pros would really like because it has some unique design features. I know a number of people who don’t really like the design here, but I wanted to try it out for myself. I often find myself enjoying the courses that offer something a little different and cater to more of a “target” style game. 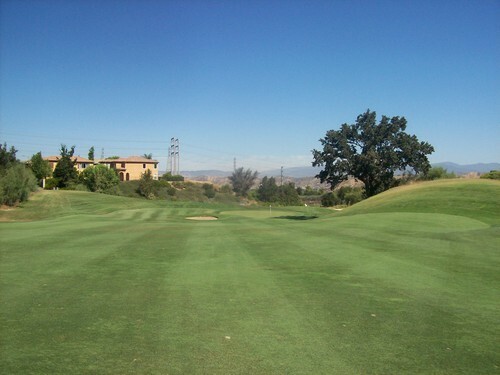 TPC Valencia is definitely target golf, but it’s not necessarily short. 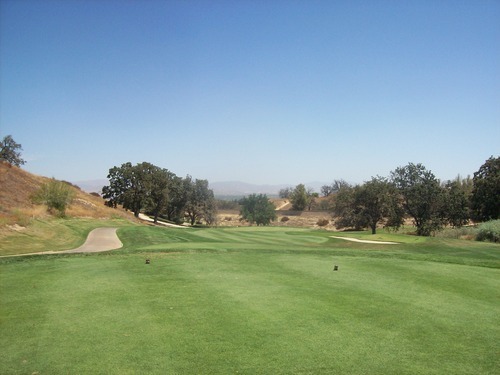 Some distance is still required to play certain holes the way they were meant to be played. From the Medal tees (silver, third set up), it is 6,440 yards. 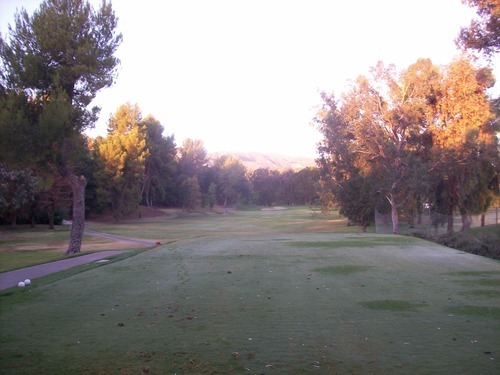 From the Player tees (black, second set up) it is 6,747 yards. 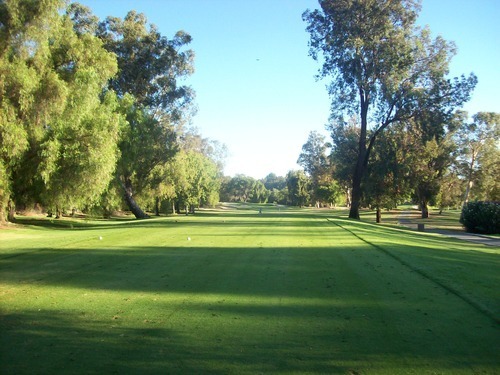 From the TPC tees (gold, the tips), it is 7,218 yards. They didn’t even have those back tees set up the day we were there. 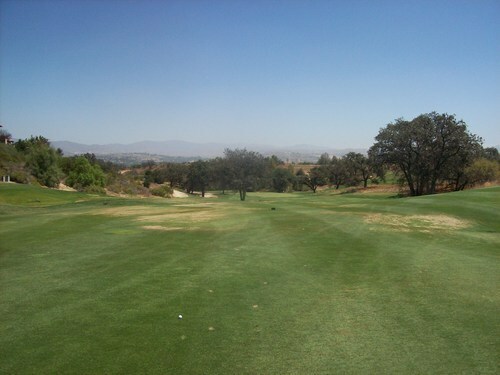 The shotgun format moved things along quickly as I played with three friends I knew through Greenskeeper.org. With only one group per hole, we didn’t push the group ahead of us at all until the back nine and we never even saw the group behind us. The total pace of about 4.5 hours was good. 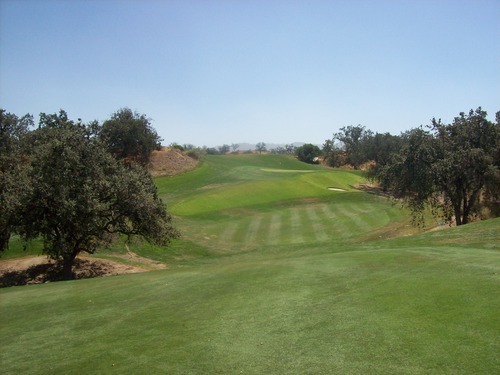 This is a tough course, so you won’t get too many quick rounds in with a full foursome of “average” players trying to tame this beast. 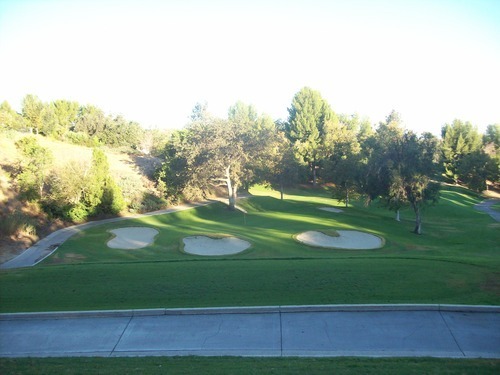 Fortunately, one of the guys in our group knew the course really well and helped us navigate some of the trickier holes. We couldn’t always execute the shots we wanted to hit, but at least we knew what we were supposed to do. 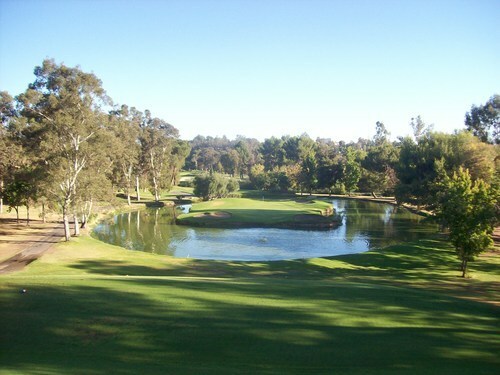 TPC Valencia is modern canyon style course that reminded me of plenty of other courses throughout Southern California. 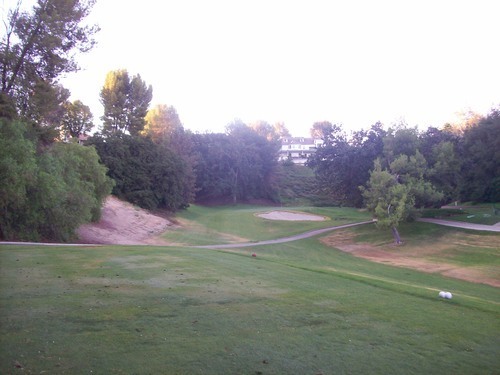 It probably reminded me most of the old Cascades course that used to be in Sylmar. 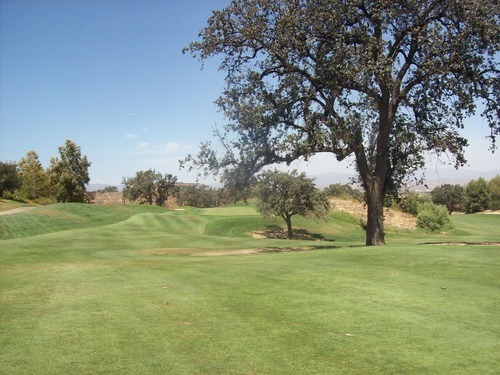 The landscape is dotted with a ton of cool, old oak trees as the holes wind their way through the rolling, hilly terrain. 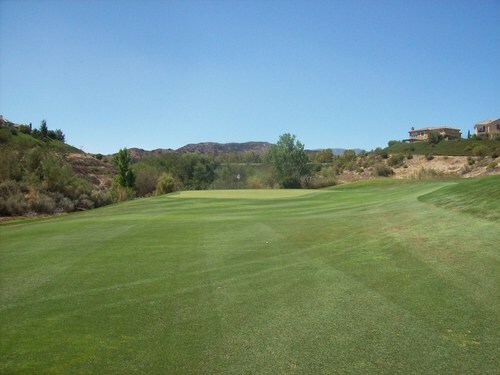 There aren’t many flat lies on the course and you really have to be on your game to score well. Most of the fairways are more forgiving than they appear off the tee, but positioning is often crucial for your approach shots. Those pesky oak trees and big hillsides can often obscure your angle in. Then, the greens are generally elevated and tough to get at, making for some really uncomfortable approach shots. 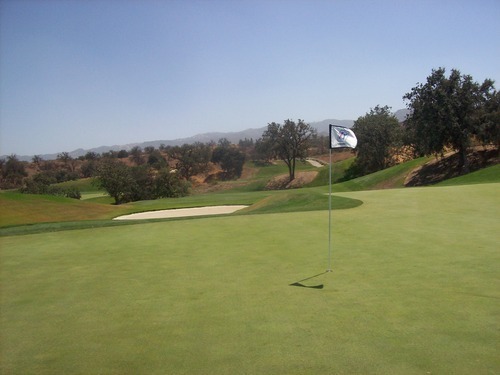 Once you are on the greens, the fun has only just begun. Though the greens aren’t really tricked out with a ton of undulation (a few are pretty tough), the breaks are very subtle and hard to read. 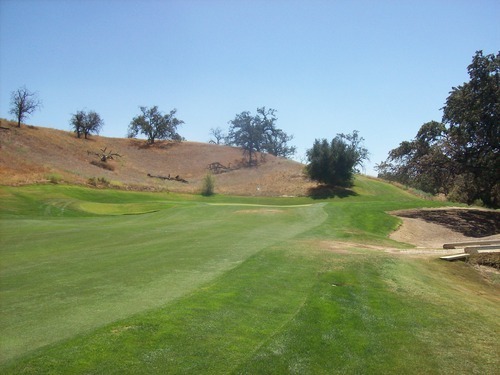 What looks uphill is often downhill, so you just have to study the surrounding landscape and not just what you see while standing on the green surface. 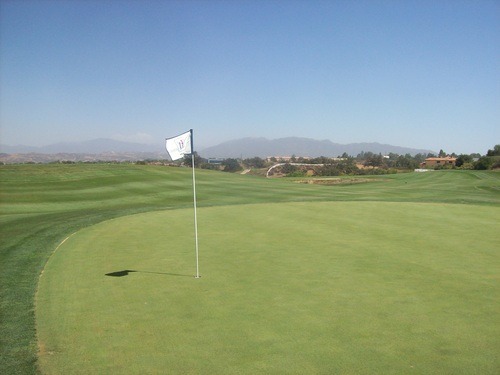 The greens were the highlight of the course in terms of conditions. They were firm, yet receptive, and rolling at very quick speeds. The rest of the course looked really nice from a distance, but had some flaws once you got up close and personal. There were some thin spots and the rough was inconsistent at times, but I would still say there was a lot more good than bad with mostly lush and green coverage. It’s hard to pinpoint any one or two holes here because there are quite a few that tend to stick with you (good or bad, depending on how sadistic you are). The 14th and 15th are a very tricky set of back-to-back par-5s. 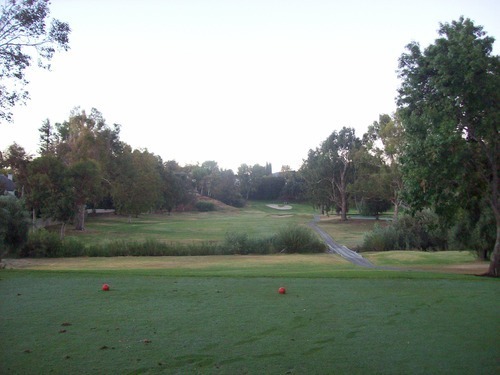 I wasn’t too fond of the 15th because there really is no good lay-up area for us average hitters that can’t reach one of the fairway sections on the other side of the “dip” in the middle. 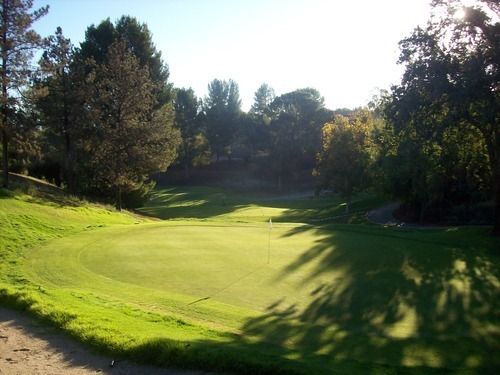 The 17th is a really fun short hole. 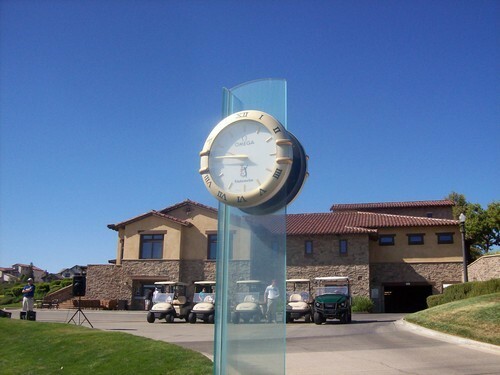 From the Medal tees we played, it was only 255 yards. I wasn’t quite able to reach it, but the layout pretty much begs you to go for it as there isn’t really an “easy” lay up option. Even though I hit a good drive and was only about 30 yards from the hole, I was still left with a very awkward approach over a big bunker to a tight back right pin. This is the kind of hole I’d like to have a crack at many times because there are so many variables that can lead to vastly different results each time. Though I can understand why some people aren’t too fond of the TPC Valencia layout, I found it fun. 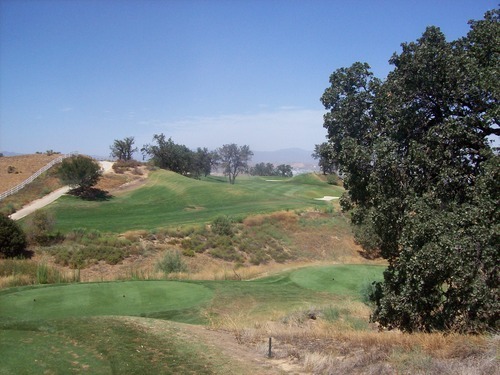 It is the type of place you have to play a lot to fully understand the strategies on certain holes, but I like a course that keeps you on your toes. I wouldn’t want to play it every day, but I could see myself coming back to play it every few years just to put myself to the test.